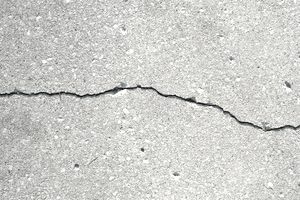 Wide cracks in concrete are best patched and sealed with a concrete patching compound. Smaller cracks, less than 1/4 inch wide, can be repaired with a concrete caulk or liquid filler. Patching compounds typically are mixed with water and applied with a trowel. They have a texture similar to grout and can be smoothed and textured to blend with the surrounding area. However, the color of the patch will look like new concrete and will not match the old concrete. Hiding the patch completely requires painting the surface with an appropriate concrete paint. Narrow concrete cracks can be filled using masonry crack elastomeric filler that can be applied with a caulking gun. Alternatively, many products come in bottles with an applicator tip. Very small cracks, such as hairline cracks, can be repaired using a vinyl concrete patching compound applied over the crack and then smoothed with a putty knife or trowel. For hairline cracks, applying repair caulk or crack filler over the cracks usually is not effective, as the caulk tends to peel off of the surface over time. Narrow cracks can be deep, often extending through the entire thickness of the concrete slab. Therefore, it's a good idea to start the repair by stuffing foam backer rod into the crack to create a base to hold the repair material. Backer rod is solid in a variety of sizes; use a rod diameter that is slightly larger than the width of the crack. Stuff the backer rod into the crack with a screwdriver to a depth of 1/4 inch. Fill the crack with the repair material, following the manufacturer's directions.